Mike Donovan is a career professional in the world of drumming. He has played in hundreds of bands through the years including some famous names such as Lee Greenwood, Faith Hill, John Berry and others. He is the proprietor of popular gift websites such as DrumBum.com and BuyGifts.com.com as well as drumming sites like Drumming.com, DrumTips.com, DrumRudiments.com, DrumChat.com and more. His life philosophy centers around the Golden Rule and he is proud to run his company and his personal life according to this principle. Mike has been playing drums for over 40 years. He started in 1975 when he was 13 years old. His father was a steel guitar player and Mike played in several country bands with him before eventually moving on to rock, R&B, and jazz. While playing in numerous bands over the years, the natural progression of wanting to be versatile and competitive eventually led Mike to a world famous school in Hollywood, CA by the name of Musician’s Institute (P.I.T.). It was there that he received an honors degree in percussion performance. 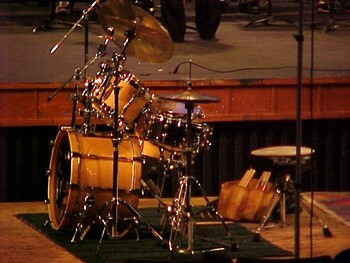 Mike’s setup at a drum clinic in 2004. From 1987 to 1993 Mike played in local rock groups, BS&M and Sketch as well as numerous jazz groups such as the Skip Gailes Quartet, Frens, and a fusion band by the name of Secrets that made quite a name for itself on the east coast. Many name players filtered through Secrets including Steve Wilson, Carter Beauford, Keith Horne and Tim Reynolds. The next couple of years were eventful as they played esteemed jazz venues and opened for such acts as Stanley Jordan, and The Yellowjackets. In 1992 Mike Donovan moved to Nashville to pursue a major artist gig. He landed the drum chair with legend, Lee Greenwood (“I’m proud to be an American”) as well as subbing for other major artists like Faith Hill and John Berry as well as Earl Thomas Conley, Vicki Bird, Denny Jiosa, The Cox Family and others. He experienced playing major arenas, political conventions, Las Vegas, and numerous TV shows within that time. Mike and his wife decided to move back home in 1996 to start a family. He opened Drum Bum in 1999 and built an impressive network of drumming sites and gift sites over the next 18 years. Mike also buys and sells domains and teaches other businesses online marketing, all under the umbrella of Kincal Enterprises (named after his daughters Kinsey and Callie). He continues to freelance on drums and build new business ventures. His greatest joy is spending time with his kids and drumming up support for a better world. The Golden Rule is at the heart of his business decisions, how he trains his staff and how he treats his customers. He runs several Facebook groups and pages such as Richmond Bands, Affys and How To Piss People Off. Besides playing drums, his ultimate joy in life is making people laugh.